2. 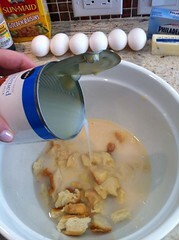 In a large mixing bowl, place the bread pieces and pour the condensed milk over the top. 3. 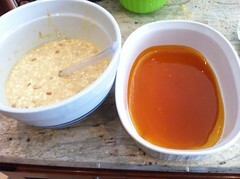 Fill the can of condensed milk with the cup of water and pour over the bread. 4. 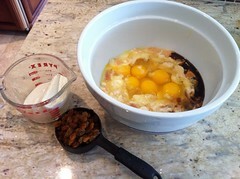 Add the eggs, melted butter, raisins and vanilla and mix well. 5. 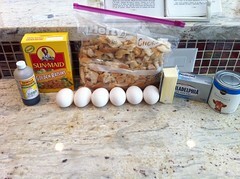 Add the softened cream cheese and finish mixing. 6. In a saucepan, heat the sugar and stir constantly with a wooden spoon until all the sugar has melted and formed into a caramel color. 7. Pour the melted caramel in the bottom of a large baking dish and swirl around the bottom to fully coat the pan with the caramel. 8. 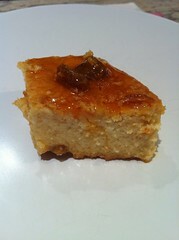 Pour the bread pudding ingredients into the caramel lined pan. 9. 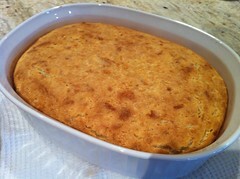 Place the bread pudding pan into a larger dish and fill up the sides, about 1", with hot water (Baño María). 10. Bake for an hour and a half at 350 degrees. Just when you thought Pudín de Pan couldn't get any better, Nitza takes it to another level and adds cream cheese. Recipe #444: Pudín de Pan y Queso is even easier to make than the regular Pudín de Pan, and since I had just made the original (no queso) last week, it was almost routine. If that can even be possible with a Project that entails cooking through 629 recipes without any desire to repeat myself. But, I digress. Just check out this bad boy, all full of cream cheese and raisins and ooey gooey awesomeness. The worst part - there are a few other Pudin de Panes to tackle. Can they really get any better than this?